Superb in autumn and fully winter hardy. 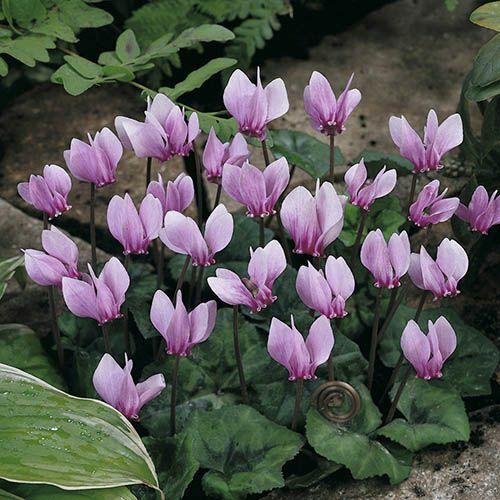 Not to ever be confused with pot plant Cyclamen produced in their masses for Christmas, these superb wild Cyclamen are a stunning garden plant for slowly naturalising in shady spots under trees and hedges, providing subtle Autumn colour and long term foliage interest. Their flowers are produced in profusion in Autumn - once established the flowers appear straight form the ground before any leaves form. As they die back in Winter, the striking silver marked deep green leaves, with whorls of splashes and random leaf markings appear, and last until the heat of the following Spring. They will slowly spread out into small clumps, and naturalise to form a delicate carpet, of totally hardy, no maintenance, almost bullet proof plants. What could be easier? Perfect for that awkward shady space, whatever size of garden you have. Supplied as a pack of 3 plants in flower and leaf in Autumn, already established and ready to plant straight out.